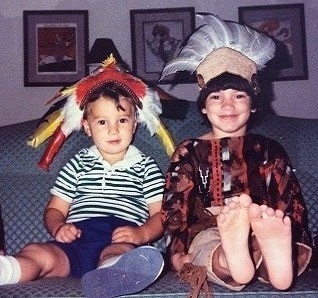 What was your childhood experience like? How did you feel loved, cared for, and special? What are your most vivid memories? What holidays did your family observe? Who was your hero and role model? 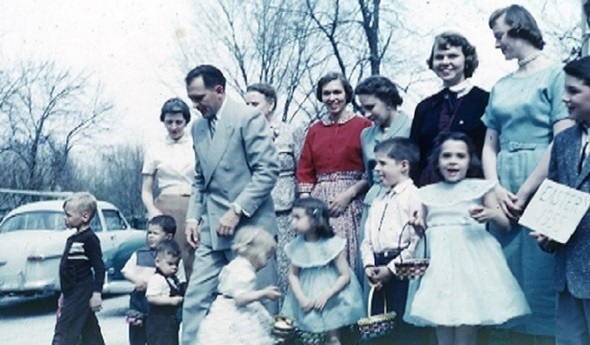 As a child in a small town in western Illinois, I was surrounded by a large family. The local Wells clan included my grandparents, my 2 older sisters, 2 younger brothers, and 6 first cousins. Here is my family gathered for my 2nd Easter. What was it like for you to leave home? Is there a story behind your going to college and your working your first full-time job? How about your developing relationships with friends and, possibly, your lifetime partner? After leaving Illinois for a university education 1000 miles to the southeast, at Duke, I met my bride. 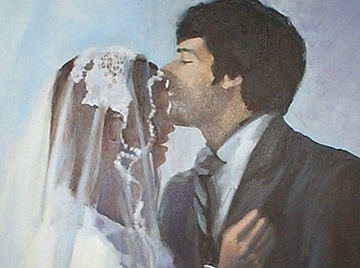 My artist older sister painted this from our wedding day. How are you growing a family of your own? What are you doing to make your family environment similar to the one you grew up in? Different? Living in Durham, North Carolina, my wife and I brought a girl and a boy into the world. Here is a photo of our pair of children. Who were the leaders of your nuclear and extended families? What were their teaching techniques to convey the values they held dear? What did the older generations’ retirement years look like? 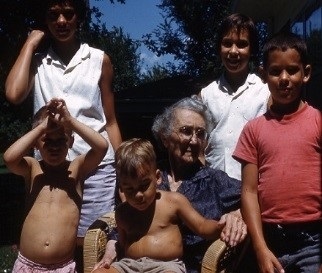 This picture of my brothers and sisters is with my Mom’s grandma. See how we enjoyed tanning in the summertime! The matriarch of the family with pre-Civil War roots in eastern Illinois, my great-grandmother traveled well, taught our neighborhood of kids how to knit, and lived past the century mark. For information about a powerful tool for building a legacy that reflects yours and your family’s values, click Donor Advised Funds. Registered Representative, securities offered through Cambridge Investment Research, Inc., a Broker/Dealer, member FINRA & SIPC. Advisory Services offered through Cambridge Investment Research Advisors, Inc., a Registered Investment Advisor. Family Legacy Concepts and Cambridge are not affiliated. This communication is strictly intended for individuals residing in the states of AZ, GA, MD, NC, SC, VA, and WA. No offers may be made or accepted from any resident outside the specific state(s) referenced. Cambridge does not offer tax or legal advice.